This is my stop on the Punch Blog Tour, a cracking new middle grade story from author Barbara Henderson. 1. What made you decide to link Phin’s story with Punch and Judy? I am a self-confessed Puppetry fan! When I was four, I had a horrible accident, which rendered me bed-bound for weeks, on liquidised food and very, very bored! My two older sisters performed puppet shows for me then, and forever after, why would you do anything else with an open doorway or an empty cardboard box? 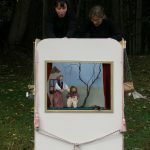 Turning it into a puppet theatre is the obvious thing to do! Once I had time at home and my children were young, I set to work – the long summer holidays were the perfect time to try my hand at building a proper wooden booth, and i still have it. Soon I was taking bookings for children’s parties, festivals and all sorts of occasions – I was officially a puppeteer. 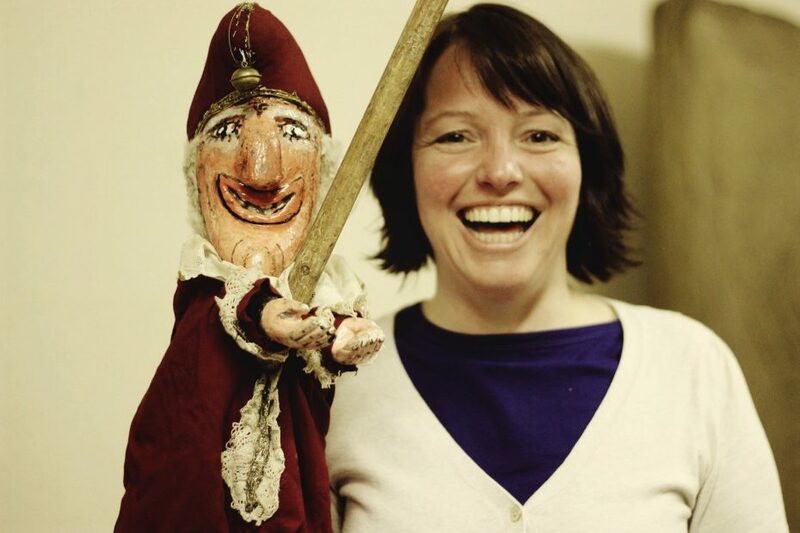 Once the children were at school and we had re-located once more, I went back to teaching – but my lovely booth has never been out of action since – I simply bring my puppets and my booth into the drama classroom with me, and it seems to work. When I was looking to create the Victorian world which my character Phineas inhabits, there was a proper Eureka moment: here was an unusual, but historical context, and I already knew a lot about it – Victorian puppeteers travelled the length and breadth of the country! The perfect combo, and something to take the book out of the standard Victorian fare of poorhouses and child labour – although the book obviously touches on that. 2. 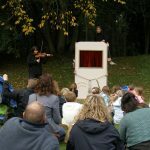 Where does your interest and enthusiasm for Punch and Judy come from? My interest is a little wider than just Punch and Judy – I love marionettes, for example and own a pretty decent collection. Recently, I have got into shadow puppetry and even use it in some of my author events, as well as in the drama classroom. Puppetry is the perfect form of drama for those who may be a bit shy: It allows you to write, to make props and backdrops, to craft or customise puppets, to create music and sound effects and of course to use voice and movement in performance, but crucially – without being looked at! Punch and Judy style puppets always go down really well with youngsters, mainly because of the speed you can move glove puppets at, and also the potential for slapstick-type comedy. I love that it is the whole of ‘theatre’ in miniature – live, immediate and striking. I love performing, writing, making, painting, music – and I can do a wee bit of each without having to excel at any one area. Awesome! 3. Tell me more about the history of Punch and Judy and it’s importance in the Victorian era? I’m pretty sure that most modern children would be a bit bemused if they saw an authentic Victorian Punch show. For a start, they called them Punch and Judy opera, and the term puppeteer hadn’t even been invented yet. Those travelling and performing simply called themselves ‘showman’ and ‘Punch and Judy man’ – and yes there were very few women, although that changed in the early 20th century. The plays would basically follow the same episodic structure: Punch would stay on stage and the performer would wear a swazzle, a small metal plate which was inserted into the roof of the mouth, and which distorted the voice to make it the distinctive Punch sound. One after the other, the characters would enter, and, by accident or design, Punch would kill them (I know! Modern parents would shudder!) until the devil comes to fetch him at the end. It may not sound like a barrel of laughs, but all this was delivered swiftly, with much chasing and slapstick-fighting. I found the research into this really fascinating. The Scottish records show that vast distances were travelled by these men and women, and that most diversified into being musicians, dancers and animal tamers, and some even travelled with dancing bears. Once I had read that, I had to include a dancing bear in Punch, surely! 4. 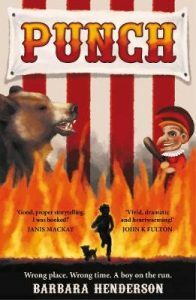 It is clear from the story how that you have done quite a bit of research on Punch and Judy, how and where did you carry out your research? Do you have any tips for children/young people wanting to find out more themselves? My research process is pretty simple: I read around the subject a lot, just to get a feel. If a detail or a particular bit of research stays with me (as in, I don’t forget it immediately), then I can safely assume that others may be as interested or intrigued by it as me. For children’s fiction, you have to be so selective anyway – too much historical context can be a quick turn-off. I can only include as much detail as my readers are likely to care about! I check out the historical timeline (after all, I can’t and shouldn’t doctor what actually happened) and then get busy with filling in the gaps with fiction. Sometimes this can be a lengthy process, as I often realise in the writing process that I have to know more. Any first draft often has notes like ‘(insert clever paragraph about soldieer recruitment)’ or whatever. But my secret weapon is the expert! I managed to locate THE go-to expert on Punch and Judy history in Scotland, cheekily made contact and asked if I could buy him a coffee. After a couple of hours enthusing on his pet subject with someone who genuinely wanted to know (me), he was willing to read the whole manuscript and give me feedback! Score! Read my review of PUNCH here.